Rob Cesternino and Akiva Wienerkur prove once again that they are the Pavarotti and Domingo of podcasting, churning out a new Seinfeld recap week after week. 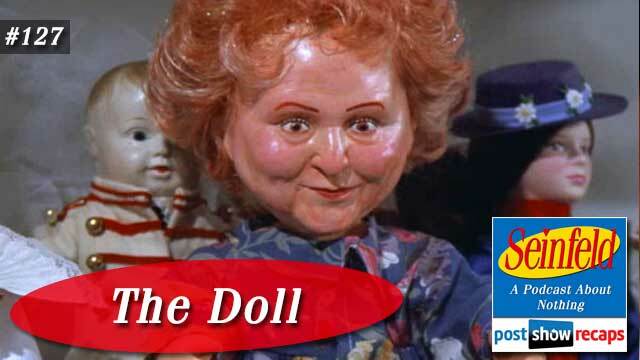 This time, they bring us “The Doll”, which first aired February 22, 1996 as part of season seven. The episode was written by the dynamic duo of Gammill and Pross. Emails – Johnny De Silveira wondered what the Tuscan Costanza imported/exported. Courtney and Cendall wanted to offer a few other ideas for the name of Frank’s billiard room. Dominic wondered if pool is at it’s least popular. Travis asked if Jerry Stiller actually forgets the line “the place to be” and they left it in. Jeff P. gives kudos to the production for finding a shirt that George has actually worn for doll Estelle to criticize. Craig thought it was strange that the symphony couldn’t follow the maestro merely because of a bent conductor baton. Paul wondered if they have learned any podcasting tips like not wearing the pants to keep the crease. Dan the benefactor wondered why George would want to set up Jerry with Sally. Matt found it interesting that Frank has no interest in politics when he was so fond of Lloyd Braun. Evan noticed that Jerry’s appearance on Charles Grodin was not shown. Lindsay wondered if they have received terrible wedding gifts. Amir thought they should have a scene with Sally and Newman. Chester pointed out that Robert De Niro first did the pants off while sitting trick to preserve the crease. He also wondered why the maestro would be so interested in playing pool at Frank’s. Lastly he thought the roughness with the Estelle doll was a bit too much. Tune in next week as the guys will recap both parts of “The Friars Club”. Send in your questions by emailing [email protected]. Don’t forget to subscribe to the podcast by going to postshowrecaps.com/seinfeldITunes where you can rate and review the podcast. You can get a discussion going about the podcast by leaving a comment on the show page, and as always, you can follow them on Twitter @robcesternino and @keev26.